Wildlife Trapping: Trapping is an essential part of what we do. In order to solve your wild animal conflict, we often have to trap the target nuisance animals and remove them from the premises. First of all, we place a very high priority on humane trapping measures. We never want to see a wild animal suffer. We only use live traps - never lethal ones. We capture the animals in live cages, and we make sure that the traps are checked every day - no animal should have to wait in a cage for more than half a day. Ideally, the animal should be removed from the area as quickly as possible. If the animal is healthy, and most of them are, we relocate the wildlife to one of several privately owned relocation points at which we have permission to relocate wildlife. These areas are far outside the developed metro Orlando area, and the animals will no longer pose a nuisance to urban or suburban environments. Species: First of all, we have to consider the target species. Of course different animals require different traps. 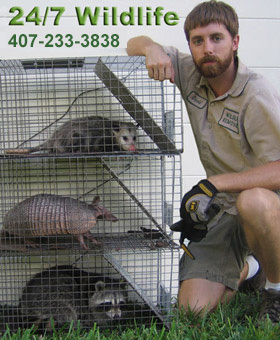 The standard large cage trap as seen in the above photo is a good size for the animals shown there - opossums, armadillos, and raccoons. However, the methods used for each animal are very different. For example, when trapping armadillos, no bait is used. Armadillos will not respond to surface bait, and bait would only attract other animals. And speaking of bait, how does one avoid catching the neighbor's cat? This is an important consideration. Opossums and raccoons are both omnivores, but they respond to different scents in the air. And what types of bait might lure in a squirrel or rat that will merely steal the food? What type of trap is used for a snake? For a bird? For a rat or a mouse? Some traps are specifically built to keep certain species of animals calm. Some are built to catch multiple animals at once. I own over 200 traps, and over 30 different varieties, and I usually need them all at some time or another. Location: Are we dealing with animals living under your house? Animals in your attic? Merely stopping by your pool at night? Have they chewed their way through a wooden fascia board, or are they sneaking into a hard-to-reach hole under the aluminum soffit? Do you live in an area with a lot of stray cats? Near a lake or a conservation area? Are there nosey kids nearby? Will the trapping be done on a roof, in a tree, under a house? Have you read the animal sign and tracks and set the traps in just the right areas? Those rat traps - are they set on the paths the rats use for travel - marked with droppings and grease? Success depends a great deal on setting the right trap in the right way at the right place, and the trap must fit the location. Conditions: What is the time of year? That raccoon in your attic - could it be a female with a litter of baby raccoons somewhere inside? Is it very hot out, leaving trapped animals vulnerable to heat stroke? Will rain wash away the bait? Does the target area have adequate clearance and visibility? Is everything safe? Are there juvenile squirrels that may be reluctant to enter a repeating door mounted trap? Etc. I often arrive at a house with a wildlife problem and see that he homeowner has tried to trap the animal on their own. The attempts are always as expected - very amateurish. I've seen, on multiple occasions, people setting squirrel-sized traps for large armadillos - ridiculous! Or again and again, traps simply set incorrectly in a nonfunctional manner. Some people buy those collapsible traps at Home Depot and have great difficulty setting them up properly. The traps are always in the wrong place, or the wrong size, with the wrong bait, at the wrong sensitivity and angle and flushness to the ground and no animal in its right mind would enter the trap. Of course, if it does, what then? Half the time the homeowner has trapped the wrong animal. If not, they don't know what to do with it. Some of them simply drive the animal down the block and let it go! It comes right back. Some people relocate it to the local park - that's illegal. In fact, a lot of the do-it-yourself wildlife trapping practices out there are not legal for people who don't have a wildlife trapper's permit from the Florida Conservation Commission. Finally, trapping animals is usually only a part of the problem. What if you've got some holes in your roof and squirrels are getting in your attic? You catch a squirrel in your own trap and remove it - great - you've still got four more squirrels, perhaps a litter of baby squirrels in the attic, you've still got the holes in your roof and the squirrel smell left over, and even if you do catch all the squirrels, new ones will enter your attic again soon. The solution to the wildlife problem is never as simple as setting a trap and carting away an animal.